Cricket is a game wherein 11 players of one team face the same number of players of the rival team in head-to-head competition. One team bats and the other fields. Matches in this game usually last for 100 (50/50 matches), 40 (20 overs per side), 80 overs (in the UK). Test matches last for up to 5 days. Cricket is one of the most widely played sports in the world. It requires great skills and practice to become a professional cricketer. It is the among top three sports in the world. Like Football/Soccer, you can play cricket anytime you want. All you need to have is a bat, ball, players, and stumps. As a teenager, I remember playing cricket with my friends. We used to play on roads or in a nearby field. We played solo as there were just 10 players in total. As my friends and myself have become busier in our lives, we don’t get time to play cricket on the field, but we do play the game on our mobile devices in a multiplayer mode. When none of my friends are online, I play cricket game on my Android mobile in single player mode. Like me, if you don’t have time to go outdoors and play your favorite sport, you should download and run the best Android cricket games. According to its developer, CWF is one of the finest cricket games for Android. The game lets users choose their favorite teams, after which they can enjoy CWF in one of the below four modes. Quick Match: Select this mode if you want to play a limited over single match. Power Play: If you have seen T20 matches, the power play mode doesn’t need any explanation. If you don’t know what PowerPlay is, let me explain it to you. Well, in PP, a player is made to bat or ball for 6 deliveries. You have to score as many runs or take as many wickets as you can. World Cup: If you can play this game for several hours, choose the world cup mode. In this event, you’ll control one team and your opponent will be computer controlled players. Press and Play: This is yet another exciting feature of CWCF game. It is an upgraded version of quick match. The Cricket WorldCup fever game for Android lets you play mini test matches that involve up to 15 overs. It offers full high-definition experience to the users who own mobiles with FHD display. When you’re playing CWCF, you have full control over the player. Whether it’s bowling, fielding or batting, CWCF lets you control the player’s movement. CWCF offers 14 teams, various difficulty levels, over five beautiful stadiums, and excellent audio effects. It has high-quality visuals and realistic background noise. It provides detail statistics of game you’ve played and has replay mode where you can check the shot you’ve played. You can play this Cricket game in multiplayer mode. Yet another top rated cricket game for mobile platforms, the WCC game provides over 40 different shots which include the trademark helicopter shot played by the Indian ODI team skipper Mahendra Singh Dhoni. As all shots are available for each player, WCC becomes an addictive game to play. WCC features a simulation mode which lets you watch the cricket game as a spectator. In this mode, the computer will play against the computer. Bowling, batting, and fielding will be automated. WCC has an excellent AI engine. It allows users to play domestic and international events/matches. World Cricket Championship 2 has over nine domestic and international cricket teams. 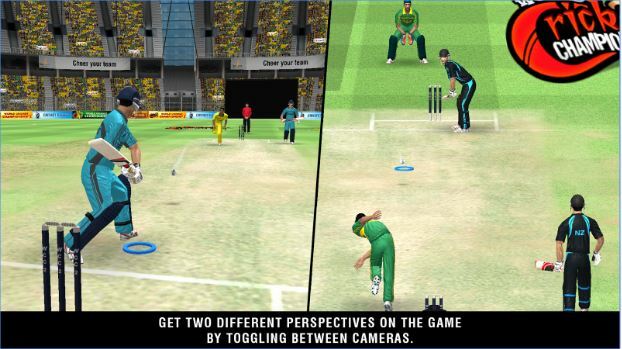 In this cricket game, players injure themselves when they select improper shot. It lets players dive on the field to take a catch. WCC provides many camera views. It offers various types of pitches, 3D charts for displaying player statistics, and excellent commentary when you are playing a match or tournament. 1GB RAM, dual-core processor, and Android 4+ OS. According to Nautilus mobile, the graphics in this cricket game were designed on paper before they’re modeled into virtual characters. Real Cricket 16 lets users learn to play the game through the net mode. RC16 has easy to use controls. Hence, handling shots, players, bowling, fielding is easy. This cricket game has eight master teams and sixteen professional cricket international teams that feature world-renowned ODI players. RC16 offers various game modes, excellent ball physics, and amazing gaming experience on a mobile device. 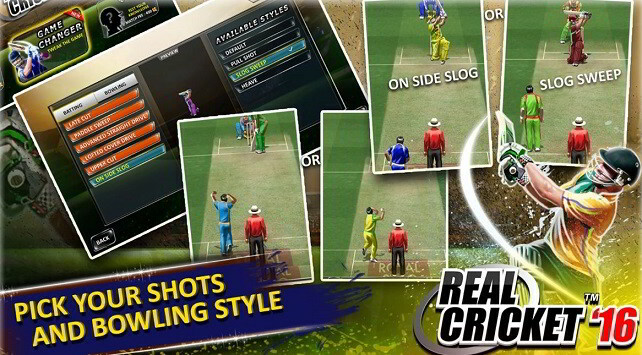 The Real Cricket 2016 game comes with similar requirements as WCC. Its size is 88 Megabytes. Conclusion: Cricket is a favorite game of millions of people. When cricket event is live, people support their favorite teams. They wait in front of big screens in shopping malls or in front of stores to watch their favorite players. If you are addicted to this game and want to enjoy Cricket during free time, make sure that you download the Cricket games we have mentioned above. The 1st three games are complete and they provide various matches and events. The remaining ones are mini cricket games that you can play in leisure time.